WikiLeaks Sudbury uncovered that the water and wastewater divisional director, Nick Benkovich, wasted and misspent tax dollars amounting to $ 59,104.65 for the water and wastewater after-hours monitoring contract. It is also found that the after-hours monitoring contractor had to complete only 10 hours of work for the 4 incidents. It therefore cost tax payers $5,910 per hour to obtain the service provided by the contractor. Furthermore, the contractor was not able to resolve any single issue related to the incidents and the City’s own staff also had to be called-in. The tax dollars paid to the contractor were a complete waste and went down the drain. The water and wastewater division has their own after-hours 24/7 coverage. The work was assigned to a contractor who has no knowledge in the city’s complex infrastructure, Supervisory Control And Data Acquisition (SCADA) system. WikiLeaks Sudbury will not disclose the contractor’s name in order to protect third party economic interests. Benkovich failed in negotiating with his own staff to maintain the after-hours SCADA monitoring service. Benkovich does not hesitate to exercise such heavy-handed management style at the cost of tax payers. He decided to outsource the service rather than use the existing available resources. This resulted in paying the contractor $5,910.00 per hour. WikiLeaks Sudbury uncovered the SCADA contract invoice. The after-hour SCADA contract invoice was directly e-mailed to Benkovich and was paid in full at $ 59,104.65 with tax dollars. WikiLeaks Sudbury was unable to uncover the breakdown of the invoice. We will release more information to the public soon after we uncover them. The after-hours monitoring SCADA contract surfaced and got attention with City council. At the direction of council, Auditor General, Brian Bigger, conducted the investigation and concluded that the City would have saved a large amount of tax dollars had they utilized their (the City’s) own staff. It is also found that that is the best and most effective solution whilst providing real value for tax dollars. Benkovich was not able to find a simple solution for the issue throughout more than two years and the contract was again conditionally renewed. The Water and Wastewater City staff is well trained and professionally qualified enough to handle any situation. But Benkovich did not consider this option and their value of service, to provide the best sustainable solution to tax payers at a substantially lower cost. WikiLeaks Sudbury uncovered an e-mail sent by Benkovich regarding this matter. It stated “With so much at stake with our SCADA system it becomes important to assure stakeholders such as Council, regulatory agencies, and customers that we have a system that delivers compulsory responses to emergent issues. Responding to overtime callouts is voluntary for CGS employees unless they are on a standby schedule”. Even though a sustainable in-house solution is available; Benkovich wrote “despite of multiple attempts they have not yet been available.” Benkovich’s e-mail read as follows: “Most recently staff has been attempting to use a concept to integrate with other existing standby rotations such as the Information Technology support rotation. They have been partnering with Human Resources to actively request to meet with the inside local union executive to develop this concept and implement it as quickly as possible. Unfortunately despite multiple attempts they have not yet been available”. Benkovich continually attempted and provided misleading information to justify hiring a contractor. His e-mail further stated: “…. and at the request of employees who cited health & wellness issues beginning to surface staff was forced to terminate the in-house rotation. This resulted in engaging the services of an external contractor to fill the void until a more sustainable concept could be implemented”. The cost-effective program was presented and Benkovich was forced to attend the meeting. Vicki Baronette, Human Resources coordinator of the Water and Wastewater division also attended with Benkovich. Benkovich had no choice left but to accept the new proposal. The proposal suggested that effective utilization of the City’s resources included that utilizing its own staff was the best solution for the after-hour SCADA monitoring contract. A large amount of tax dollars would have been saved. Benkovich’s incompetence is exposed and his attempt to bid for General Manger position, infrastructure services also failed. Benkovich faced over 340 grievances from about 137 employees in the water and wastewater division. Throughout his career he engaged in abusing his power and authority at the cost of tax payers. There are allegations that Benkovich engaged in sexual misconduct in the workplace. 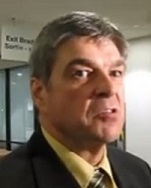 Benkovich utilized tax dollars to defend the case against him at the Ontario Court of Justice. Unconfirmed reports found that there is still yet another $2000.00 that needs to be paid back to the City by Benkovich. Benkovich is still the director of the Water and Wastewater division, raking in an annual salary of over $130,000, drawing from tax dollars. Enough's enough, It’s time to quit. The original article initially published on Law and Social Change, 60:357–374. Excerpts from the article as follows. Etymologically, the term corruption has a much wider meaning than what is commonly used today. Stemming from the Latin corrumpere, the word finds its origins in a combination of the words com or con, meaning together or total, and rumpere, which refers to decay or dissolution. In this literal sense, then, when something corrupts, the whole of which it consists comes apart. When referring to people, this unravelling was understood as a deviation from (a moral) duty. Essentially, corruption was equated with the loss of virtue and thought to manifest itself in behaviour contrary to public or civic duty. As Doben put it ‘corruption is the loss of a capacity for loyalty’ by which he explicitly meant loyalty to communities or societies as wholes rather than to groups, classes or factions. Loyalty to the latter at the expense of the former would imply a loss of virtue and the proliferation of particularism, some of which give clear resemblance to corruption as discussed below. Clearly, however, not all loss of virtue and loyalty share this resemblance. This broad notion of corrumpere is different from what is now understood by corruption. In contemporary usage, the term corruption has come to connote only deviations from duty which have a distinctly material character. Hence, the most commonly used definition of corruption is ‘the misuse of public office for private gain.’ Clearly, the term ‘misuse’ implies that deviation from duty remains an attribute of this definition. However, the explicit reference to ‘private gain’, which infuses the concept with a material component, narrows the concept’s reach considerably. As a consequence of this narrowing of the concept over time, usage of the traditional Latin meaning of the term in academic analysis today would risk committing conceptual stretching. This does not mean that the connotation embedded in corrumpere has disappeared from contemporary usage. Quite the contrary, deviations from duty is still at the heart of understanding corruption. In this way, the Latin meaning lives on. Indeed, this is arguably the reason why measuring corruption is so difficult: people hesitate to disclose deviations from duty, even when there are no risks of sanctions, because of the immoral or asocial connotation of such actions. However, contemporary usage refers only to a subset of the Latin term’s denotation. For instance, regarding sleeping on the job, certainly a deviation from public duty, as an act of corruption would be incongruent with contemporary usage. It is worth mentioning that the narrowing of the concept ‘corruption’ is most pronounced in analyses of public (as opposed to private) corruption. Quite frequently, analyses of workplace malfeasance discuss topics such as sexual harassment, and unethical decision making under the rubric ‘corruption’. In these discussions, the traditional Latin meaning has resisted the conceptual narrowing which has taken place in other fields. While some scholars argue that business-to-business malfeasance such as public-sector fraud and workplace theft should be considered corrupt, and while undoubtedly such malfeasance and corruption have a lot in common, the present discussion maintains that corruption, as the reference to ‘public office’ in the above-stated definition indicates, is by definition a public sector phenomenon. Thus, throughout the following, ‘corruption’ should always be taken to mean ‘public corruption’. And in discussions of public corruption, the material connotation is unequivocally dominant. As far as the present subject of discussion goes, then, the term has indeed narrowed. And there is very little doubt that acts of what is today termed (public) corruption would be encompassed by the connotations of the original corrumpere, but not the other way around. Descending from the first to the second rung on the ladder means narrowing the conceptual scope from any deviation from public duty (corrumpere) to a particular type of such deviations: breaches of impartiality. This notion encompasses a number of phenomena which are often considered indiscriminately. Impartial government has been argued for more than a decade now to positively affect a wide variety of desirable outcomes; from democracy and the rule of law to economic growth, public health, and the environment. However, deviations from the principle of impartiality consists of types of transactions which might systematically diverge in their nature and causes, and which may affect one another in ways that are overlooked if particularistic governing tout court is chosen as the topic for analysis. Clientelism, on its part, is an electoral strategy, or more broadly a strategy towards obtaining or sustaining political support, rather than a means toward administrative control. Clientelism, then, ‘refers to exchanges between a political [leadership] and individuals in which the former releases a benefit that the latter desires in order to secure their political support’. The linkage between citizens and leaders using this strategy is based clearly on self-interest, inasmuch as leaders target material inducements directly towards individuals or small groups in return for their support, vote, or consent. Unlike clientelism and patronage, the realm of pork barrel politics lies on the margins of particularistic governing. However, since it constitutes a subset of such deviations which is extensive in some political system, it deserves mentioning. Returning to the ladder of abstraction, corruption is not the lowest rung. However, moving beyond this rung, concepts become very specific indeed. At the first stage, the bribe is corruption in a specific form13: the direct exchange of material payment in exchange for breaching the principle of impartiality. Clearly, using this conception, all bribes are corrupt. The direct exchange of money, of course, is to many the quintessential bribe – the fat envelope is the notorious symbol of corruption in many places. However, material payment can take other forms: bottles of expensive whisky, tickets for sporting events or for travels, and so on. The final rung on the ladder of abstraction pertains to the distinction between ‘grass-eating’ corruption (where officials accept, but do not demand, bribes) and ‘meat-eating’ corruption (where officials demand bribes in order to fulfil their tasks). This distinction in the scholarly discourse has come to embody the conceptual difference between bribes and extortion. Extortion, then, occurs when bureaucrats or politicians initiate the bribery transaction on threat of not performing a task unless a bribe is paid. Extortion encompasses all the characteristics of a bribe–indeed, it is a bribe–and has been argued to be largely a superfluous concept since the difference, in practise, between the two is marginal. Mikkelsen, K. S. (2013). In murky waters: A disentangling of corruption and related concepts, Crime, Law and Social Change, 60:357–374.